Three students' photos on the New York Times Lens Blog! 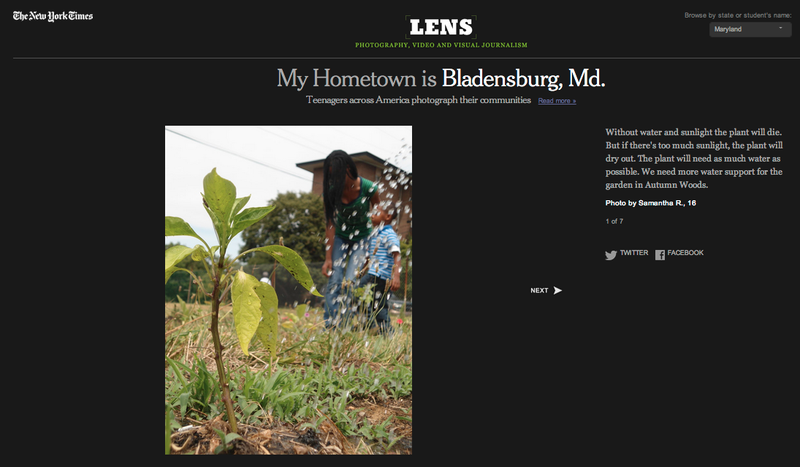 Three of our students photos are a part of The New York Times Lens Blog's project "My Hometown." Youth from all over the country submitted over 4,000 photos documenting their hometowns. One of our students' photos was even selected as one of the 145 Editor's Picks! To see them, visit the Maryland and D.C. sections from the dropdown menu in the upper righthand corner of the website. ClickIn Moms - a community or artists, hobbyists, and professional photographers - interviewed Critical Exposure about our work. Click the title to read the interview. To see accompanying photo slideshow, click here. The small band of guerrilla photographers spread out in schools across the District, snapping photos of metal detectors, police pat-downs, and scuffles between security guards and students. The dozen or so teens, who hail from some of the area’s most troubled neighborhoods, are trying to document the kind of school security issues that have taken center stage in the wake of the Newtown, Conn., shootings. Since the December tragedy, the question of whether schools are safe has gained new urgency, with the Senate weighing $40 million in funding for school security plans and the National Rifle Association — which has called for armed teachers, administrators or guards in every school — releasing recommendations from its experts Tuesday. But H.D. Woodson High School senior Mike Ruff and other classmates have armed themselves with cameras to make the opposite point. They say that their learning environment has been scarred by relentless security. They say their high schools, among an estimated 10,000 nationwide with police on campus, feel like prisons. They’re hoping to use the photographs to persuade D.C. school officials to start a “restorative justice” program to cut down on the 6,000 students or so who were suspended last school year, some multiple times. But in the current climate they may have trouble winning over school administrators such as the principal at Woodson, who says he thinks tight security is crucial to keeping kids safe. One month after Newtown, Ruff and about a half-dozen classmates gather in a stuffy classroom on the third floor of the Thurgood Marshall Center in Shaw. The Critical Exposure program, founded in 2004, teaches students to advocate for change by giving them cameras to document disparities in their urban neighborhoods. In the past, students have gone into Wilson High School in affluent Northwest Washington and photographed the shiny bathrooms to compare them with the run-down facilities at Roosevelt High School in Petworth. One snapped a shot of a teacher sleeping in class. And it took just a few of their compelling images of an empty room with boxes of books to help persuade the school system to allocate $18,000 for a new library for Washington Metropolitan High School in LeDroit Park, they say. This year, the kids toss ideas around and decide to consider the “school-to-prison pipeline,” the term for tough discipline practices that critics say take students out of schools — through suspension, expulsion or arrest — and funnel them directly into the criminal justice system. Two days later, Adam Lanza walked into Sandy Hook Elementary School carrying a loaded Bushmaster .223-caliber XM-15 rifle and three other 30-round magazines. In the wake of the mass shooting, which left 26 people at the school dead, including 20 children, the national mood shifted dramatically. As calls for heightened school security spread, the Critical Exposure kids interviewed a half-dozen local advocates, earnestly writing down their views on big dry-erase board: How armed guards increase the number of student arrests. How zero-tolerance policies unfairly target minorities. How kids who are suspended are more likely to end up in trouble with the law later in their lives. In the end, they decided it was precisely the right moment to embrace such alternatives to suspension as restorative justice, which uses administrators or peers to mete out in-school sanctions. The practice is permitted but not generally used in D.C. public schools, a spokesman said. But such programs have helped cut suspension rates in other cities, such as Baltimore. One day after school, Ruff and his best friend, Deante’ Spillman, grab their Canon cameras and head outside to take photos in front of Woodson. As Ruff moves around the front steps, angling for a better shot, a skinny classmate in a ball cap approaches. In Ruff’s younger days, when he got mediocre grades and “literally did not care,” he might have said something, fought back. But he and Spillman just give each other a sideways glance and walk away with studied calm. “Guess that’s not going to work,” Ruff says once they are at a safe remove. The two dissolve into laughter. Ruff, who grew up mostly in Northeast, said he is used to how things can go wrong fast. One girl stabbed another just off school grounds recently. The other day, he and his brother had to skirt a smear of blood on the pavement on their way to the gas station for a snack. Ruff eventually found more through a mentoring program and through Critical Exposure. He raised his grade-point average from 2.4 in 10th grade to 3.73 this year and won two scholarships worth a total of $60,000. But the intense security of the place still chafes at him. The way he has to remove his belt as he goes through the metal detector, “like you’re going to visit somebody.” The way students are prohibited from using the school’s central staircase, which the principal says is done to protect them from potentially dangerous visitors coming in the main entrance. And the fence, designed to keep vandals out, still grates on him. As time goes on, the students begin compiling photographs and spend hours after school analyzing them in slide shows. There’s Ruff’s photograph of the black sweep of the fence and a close-up of a forbidding lock. Samera Paz, a Cardozo High School senior, took a photo of a young man’s ankle, wrapped with an electronic-monitoring device next to an old-timey composition book. Sean Woodland, 18, whom everybody calls Lucky, snapped a photo of a student and police officer arguing near his school and others going the security line at Luke C. Moore Academy in the District. He wanted to capture the stifling atmosphere. He feels it’s different from the open feeling at Old Mill High School in Anne ArundelCounty, which he also attended. Even the pizza tasted better. But now the physical landscape at suburban schools may edge closer to that at urban schools. In the District, all but two high schools and middle schools have metal detectors. Hardy Middle School in Northwest and the School Without Walls Senior High School in Foggy Bottom do not. All D.C. high schools and some middle schools have campus police, known as school resource officers. Prince George’s County is considering an $8 million proposal to create a school police force, along with adding electronic-controlled access and panic buttons in the main office of each school. Prince William County wants to add 15 school resource officers, andMontgomery County wants to double the number of school resource officers. Even tiny Dumfries voted to hire a police officer for its one elementary school. This week, the NRA released details of its National School Shield Report, calling for armed guards in every school that can afford them and firearms training to arm staffers in smaller, rural districts that can’t. After school one day recently, the students gather in front of the Capitol at a rally organized by a national group called Dignity in Schools, hoping to call attention to school safety policies they think are harmful. Paz waves a homemade sign in the cold March wind with two small circles cut out of notebook paper to represent handcuffs. When one of the speakers cries into the loudspeaker, “Cops out of schools! That’s what we want!” everybody cheers. Ruff and Spillman arrive late, taking a long transit ride to get there. After all that effort, Ruff is disappointed by the low turnout — just about 30 people — hardly the massive demonstration he had been expecting. But, as the group moves up Pennsylvania Avenue chanting “College prep, not prison prep,” Ruff says he thinks their Critical Exposure campaign will be successful. Finally, they gather in a circle in Lafayette Square, each picking up a flickering candle and a photograph of students who were victims of gun violence. The sun disappears behind the White House. They are quieter now but still hoping somebody can hear them. Washington, DC - On Monday, March 4 at 4pm a national coalition of students of color and allies from around the country, including members of the Dignity in Schools Campaign (DSC), the Advancement Project, the Alliance for Educational Justice, and Washington, DC-based youth organization Critical Exposure, will hold a rally on the NE corner of the U.S. Capitol Grounds to call on congress to reject school safety policies that promote an increase in police, school resource officers (SRO’s) and armed guards in our nations’ public schools. The coalition is urging Congress and the Obama administration to instead focus on proven positive measures like positive behavior intervention and supports, social and emotional learning, restorative justice, and the hiring and training of counselors, social workers, and community intervention workers. Members of the coalition will be in Washington DC on March 4-5, 2013 to meet with members of the U.S. House and Senate and the U.S. Department of Education. The coalition will present its “Statement by Youth of Color on School Safety and Gun Violence in America” and promote its “You Can’t Build Peace With A Piece” social media campaign to mobilize students of color from around the country and raise awareness about the policies that transfer school discipline issues to the criminal justice system. In January, the Dignity in Schools Campaign, together with the Advancement Project, NAACP Legal Defense and Educational Fund (LDF) and the Alliance for Educational Justice released a joint issue brief outlining the problems already experienced by stationing police and armed guards in schools, and offering alternative recommendations. WHAT: Youth of color-led rally at the U.S. Capitol Building and march to the White House to call for positive approaches in response to gun violence and address the impact of school safety policies on youth of color. WHO: National youth of color-led coalition including youth members and allies from the Dignity in Schools Campaign, the Advancement Project, the Alliance for Educational Justice, and Washington, DC-based youth organization Critical Exposure. WHERE: NE corner of the U.S. Capitol Building, at the intersection of First St NE and Constitution Ave. NE, Washington, DC. Founded in 2004, Critical Exposure uses a unique approach to empower young people to improve their lives and address serious issues by combining art with advocacy. Students use photography to document challenges they face like inequities in education, poor school facilities, teen pregnancy, and youth homelessness. Students then learn to use their images and voices to build support for solutions. Critical Exposure has trained more than 1,000 students and helped secure more than $500 million of new funding for public schools in underserved communities. The Dignity in Schools Campaign is a coalition of youth, parents, educators, civil rights organizations, and social justice advocates working to ensure the human right of every child to a quality education and to be treated with dignity. The DSC challenges the systemic problem of “push out” and promotes local and national alternatives to a culture of zero-tolerance, punishment and removal in our nation’s schools.